What Nasdaq technical glitch? The big story on the Nasdaq Friday: Microsoft's (MSFT) stock soared following news that its CEO Steve Ballmer will retire within the next 12 months. 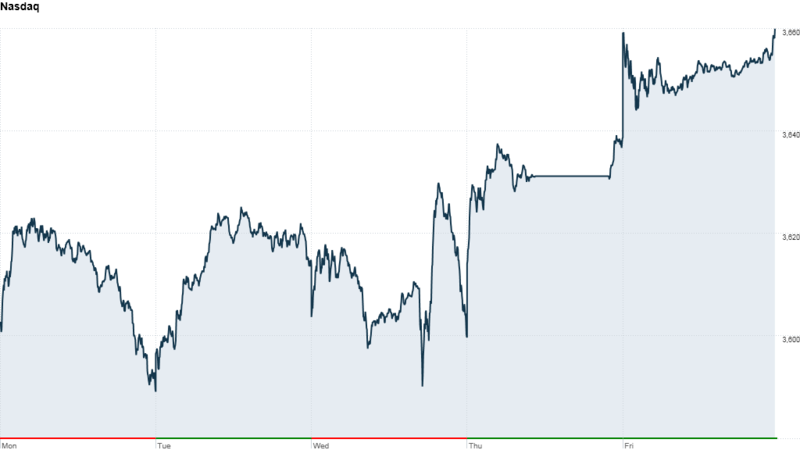 The Microsoft news helped the Nasdaq end in positive territory for the day and gain nearly 1.5% for the week. The Dow, despite moving slightly higher Friday, fell for the third straight week. The S&P 500, up for the day, ended the week up 0.5%. Market action appeared to be glitch-free, a relief one day after technical troubles shut down trading in all Nasdaq-listed stocks and options for several hours. Big moves in Microsoft: Microsoft's shares gained more than 7% following the Ballmer news. Microsoft is one of the 30 stocks in the Dow and one of the largest companies listed on the Nasdaq. So its big move helped to lift the broader market. MadeofGold: $MSFT congratulations Microsoft employees! stkcon: $MSFT Every business needs new blood, new thinking or it becomes stagnant. $YHOO's a perfect example. $CSCO should make a few moves, too. Stevez1: $MSFT dead short right now until they resolve who might be CEO. Please no one from Google!! Mike Dell decent match if they could get him. It seems that Dell might be a little busy trying to take his own company private though. Facebook hits 40! : Facebook's (FB) shares soared more than 5% and closed above $40 for the first time ever. Some traders on StockTwits marveled at the ironic timing following Thursday's Nasdaq glitch. supermanjoe: $FB Now That it's Hit $ 40.. Fast Run to $45 On Way. Aeropostale (ARO) shares plummeted after the teen retailer posted weak results. Its poor outlook follows similarly bleak forecasts from rivals American Eagle Outfitters (AEO) and Abercrombie & Fitch (ANF). Pandora (P) reported strong earnings, but the stock plunged after the online radio company issued softer-than-expected guidance. Dansumthing: $P is down big because management said they intend to focus on growing revenue and marketshare more than earnings over the next few qtrs. More on the 'Spazdaq' glitch. Nasdaq (NDAQ) shares gained more than 1%, bouncing back from a 3% drop Thursday following the trading halt. Late Thursday, SEC chair Mary Jo White said the trading halt "should reinforce our collective commitment to addressing technological vulnerabilities of exchanges and other market participants." The SEC plans to speed up its efforts for new rules to strengthen markets. White said she intends to hold a meeting soon with leaders of the major exchanges and other market participants. Global markets mostly higher. European markets ended higher. In Asia, markets in China ended with narrow losses, but Japan's Nikkei rallied by 2.2%. Will the #Nasdaq halt impact your investing strategy? @CNNMoney wants to hear from individual investors: Email hibah.yousuf@cnn.com.